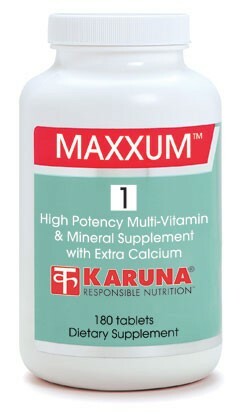 MAXXUM 1 is iron-free, presented in a tablet delivery form, and ideal for patients requiring a cost effective, high quality multi with clinically supported bone health potency. Meaningful levels of individual natural carotenoids are present, including amounts of lutein associated with preserving the health of retinal structures (Acta Ophthalmol Scand 2002;80:368-371). Tablets are medium sized, easy to swallow and homogeneous. Coating on these all vegetable tablets is guaranteed to dissolve easily, allowing complete release of nutrients. Suggested use for adults: 6 tablets daily, taken with meals, or as directed.